Sonos talks Dolby Atmos, DTS, sound quality and Beam soundbar | What Hi-Fi? The Sonos Beam is looking to fill an obvious gap in the smart speaker company's product line-up. Not only is it one of the more affordable Sonos speakers on the market, it's built for prime position underneath your TV. If you want an affordable entry into Sonos ownership that delivers music and movie sound, the Beam could now be the answer. And it isn't short of features. There's an HDMI input on a Sonos product for the first time, plus Amazon Alexa voice control. Apple AirPlay 2 and Siri voice control should be ready by the time of launch, too. That said, AV enthusiasts will point out a couple of specifications that aren't on the sheet - DTS (still) and Dolby Atmos. 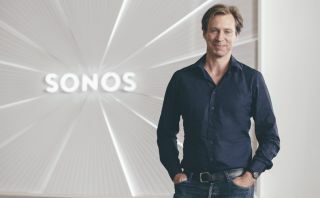 We spoke to Giles Martin (Sonos sound experience leader) and Hilmar Lehnert (senior director, audio systems engineering) about the making of the Beam, about how Sonos approaches sound, and the thinking behind some of those feature 'omissions'. The most important aspect of any audio product for What Hi-Fi? is sound quality. And it seems Sonos thinks in a similar way. That said, the company is keen to point out there isn't a Sonos sound - instead it's all about the speaker having no impact on the audio, an idea familiar to any hi-fi fan. As Lehnert says: "We start with the target of transparency." And as Martin makes clear, it was a fresh slate for the Beam: "we have a sound experience we want to reach... we want to exceed that. We don’t look at it to [just] make a smaller Playbar." So what form does that take when it comes to creating a speaker built to deliver TV sound and music? “If you can’t hear the dialogue, you’re dead... [but] music is more sensitive to a speaker than film and TV.” We get the impression Sonos remains music first, albeit ensuring you never have to suffer through hard-to-hear speech on TV or films. When it comes to reviews at What Hi-Fi?, we're all about comparative testing. Does X sound better than Y? Is that how Sonos work? “We do a little of that... but what we focus on is what is the right customer experience. When we started building this product there wasn’t really anything in this space," says Martin. What about Sonos' own products? How does the Beam sound compared to the Playbar, for example? "A little less aural output, not as deep and not as wide," answers Lehnert matter-of-factly. The Playbar is twice the price, after all. Sonos seems happy it's got the sound nailed with Beam. So what about the features? We approach the potentially thorny subject of Dolby Atmos. There is no Atmos here so, first things first, is it coming? "Not to this product, no," says Martin. Sonos works with a host of music and movie industry professionals on the performance of its products and clearly takes a lot of their feedback on board. One such person is Academy Award-winning sound mixer, Chris Jenkins (Mad Max: Fury Road, Batman v Superman: Dawn of Justice, Love & Mercy). And he wasn't taken with Atmos sound from existing soundbars. "We found in a product this size… when we listened to some products which were way more expensive that did Atmos…" Martin tails off, making a somewhat unimpressed face. "Chris said to me, 'that’s got good height, but I didn’t put that stuff up there'. And we have to get it right. It would be a good thing to stick on the side of product but it has to work. People like the label and the idea before they even know the thing," concludes Martin. It seems they don't rate the performance of Dolby Atmos on soundbars, which, let's face it, is not the most controversial opinion we've heard - it's certainly one shared by plenty of disbelieving What Hi-Fi? readers if comments on our reviews and articles on the subject are anything to go by - even if we are fans of products such as the Atmos-touting Sony HT-ST5000. And we wouldn't disagree with the idea that Atmos comes into its own when heard on a multi-speaker home cinema system. Martin says he's a fan of Atmos in full-size cinema systems, name-checking KEF products and Dolby's Atmos cinema in Soho - and he has produced Atmos soundtracks - but he's not convinced that it's right for a product such as this. Will an Atmos mix folded-down to work out of a soundbar sound better than a 5.1 mix? Martin's not sure. "Mono is better than bad surround," he adds. As with plenty of other companies, consumer demand coupled with product performance is clearly what drives the development process. Sonos no doubt believes the additions it has made to the Beam, in the form of voice control, HDMI connectivity and deeper Apple integration, will prove more compelling to more people than adding DTS or Atmos support - and make for a better overall product. And regardless of the features, sound quality remains at the heart of the product. "The best smart speaker for smaller homes" is the tagline on one Sonos Beam promotional video - we look forward to getting our hands more fully on the Sonos Beam to see if we agree.